Difficult to talk about your favorite city, but for me, Split is really the coolest city in Croatia. The city has it all! Delicious beaches, without so many people and with the cool blue sea. 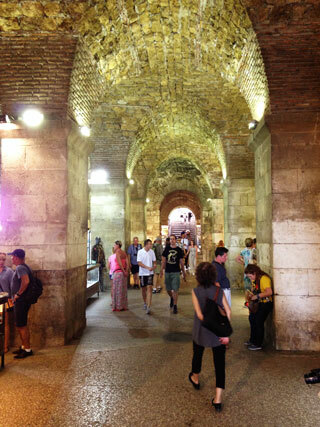 Lots, lots of history with the whole Diocletian’s Palace to be explored. Hundreds of dining options for all tastes and pockets. And, moreover, the city is the national capital of fashion; full of local boutiques and stylish people! Not to mention that Split is super well located and is a great choice for anyone who wants to do day trips. 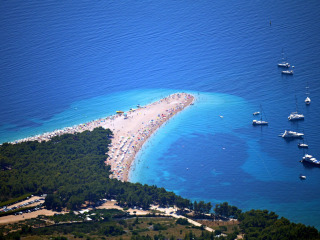 Want to enjoy the beach, swim in the Adriatic Sea and get tanned? 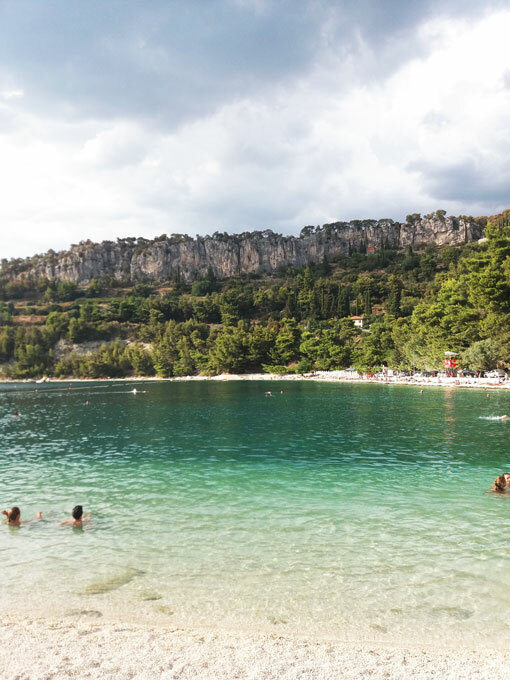 Check the best beaches in Split. 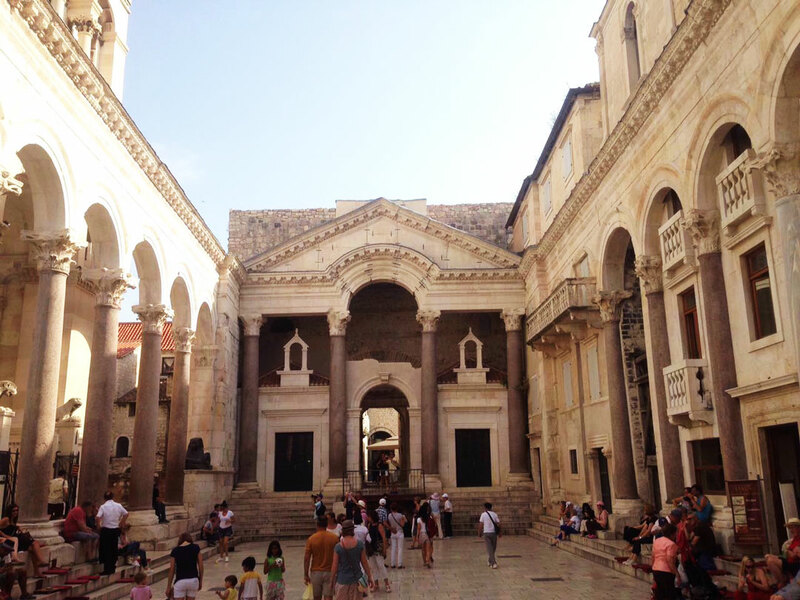 Diocletian’s Palace is one of the most amazing places you will visit in Croatia. Do not miss a chance to explore every bit of it. 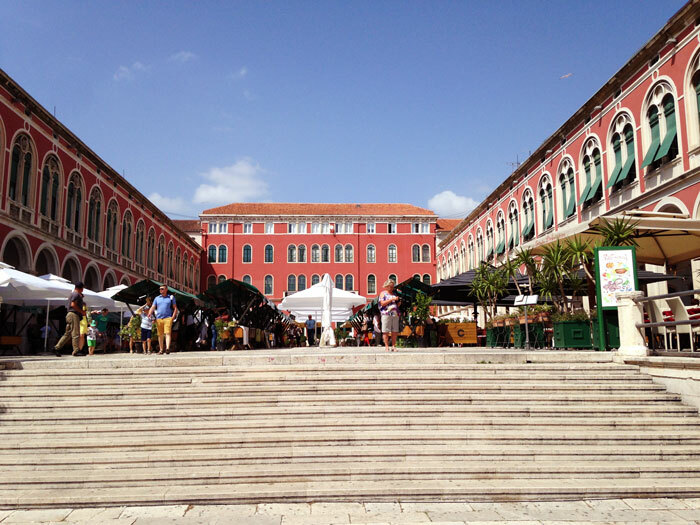 The best restaurants, where to shop and what to see in Split? We have the local tips! Get off the beaten path and experience what the city has to be more authentic. Do you have more time in the city? Make sure you take day trips around the area. 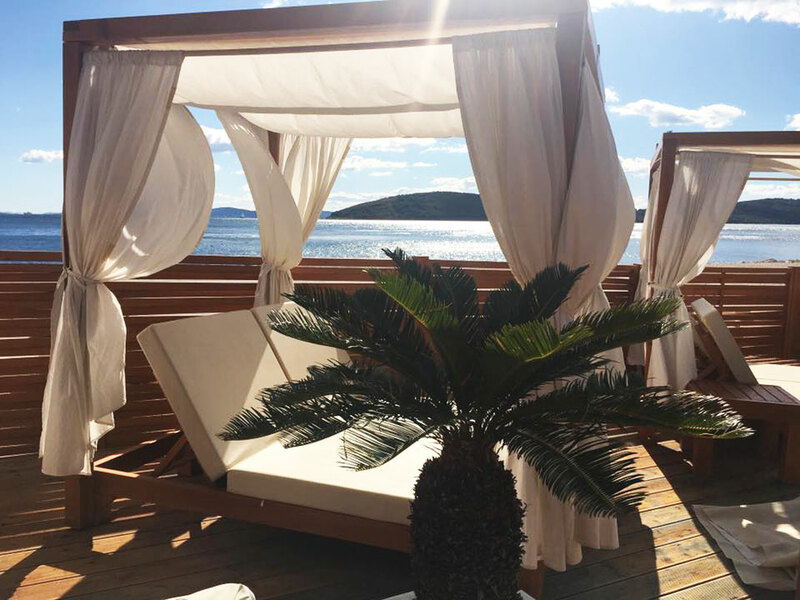 Wineries, boat trips for the islands of Hvar, Brac, Vis and much more! Built in the 5th century BC the Palace of the Roman Emperor Diocletian, is one of the best preserved in Europe. It is difficult to believe that many people still live in inside this piece of history. The palace is on Riva, the seaside promenade of the city. Very close to the port, from where lots of ferries, catamarans, and cruises arrive and depart. And close also to the bus station. To be able to experience the best of Split I suggest spending at least a day and a half, and if possible, two days in the city. It is cool to explore the site during the day, visit the underground gallery and get lost in the alleys. But I also find it very amazing to visit the palace at night. With the night lights of the palace, bars, and restaurants the atmosphere of the city changes completely. The palace has a lot of interesting things to see. The Cathedral of St. Domnius has the bell tower with 57 meters of height that, for those who have breath, can be visited. I do not even need to tell you how is the city view from up there, right?! 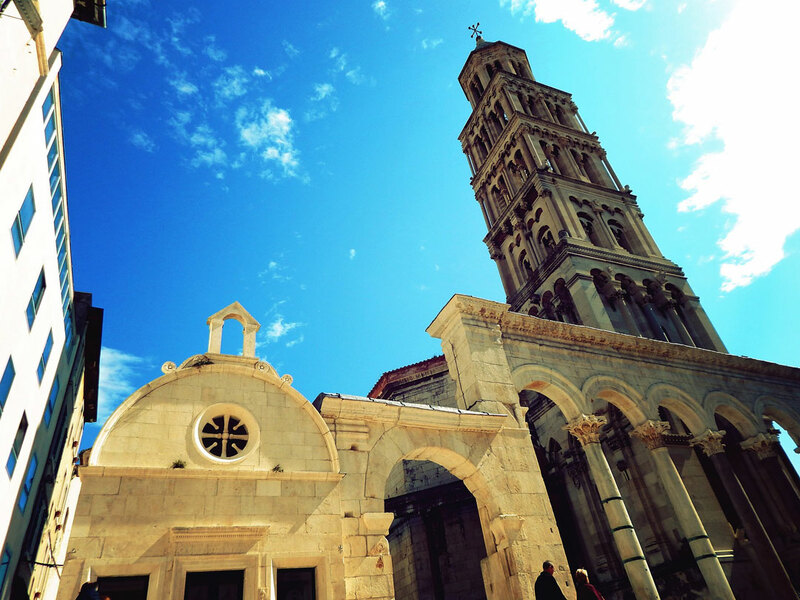 The cathedral has a medieval architecture and is considered the most original of Dalmatia. It’s construction started around the thirteenth century. The gates of gold and silver guard the ancient doors of the palace. In front of the golden gate, you will find the sculpture of Bishop Gregius, of Nin. The sculpture is a work of Ivan Meštrović the country’s most famous sculptor. Going through the silver gate you will be very close to Plac, the market of Split. There are souvenirs, antiques, and the most important: local delicacies. Be sure to taste the dried and sugary orange and lemon peel (arancini); and sugared almonds. But I assure you, there are great possibilities of addiction for these delights! Next to St. Domnius Cathedral is the impressive Vestibule and the Peristyle. The Peristyle was the central square of the palace. The red granite of the columns emphasize the ceremonial function of the site; used to praise the Roman Emperor Diocletian as the son of Jupiter. In the old square, there are also influences from ancient Egypt. The preserved sphinx, on the left side of the Vestibule, is about 3,500 years old and was brought by Diocletian himself to decorate his residence. The palace also has a whole infrastructure below sea level. In the open part, where the entrance is free, are the galleries, with different shops of crafts, jewelry, semi jewels, and souvenirs. There is a large section closed to the public, but the eastern part has been renovated and opened for visitors since 1995. There was recorded some scenes of Khalessi. The Mother of Dragons (Daenerys Targaryen) of the series Game of Thrones, saved her Dragon eggs at this underground. The entrance to the underground can be made through the Porta Aenea, from the Riva, or by the stairs of the Peristyle. Currently, space is used for exhibitions of painting and sculpture, plays, fairs and many other social and cultural events. 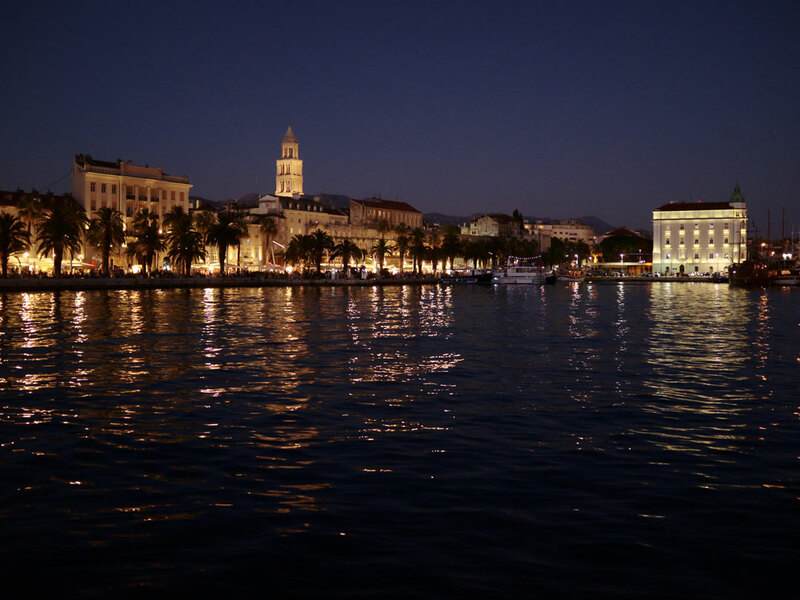 The Riva would be the sea sidewalk of Split. It is where, during the summer, several stalls of local crafts, souvenirs, food and other cool things are sold. At Riva is where the day trips depart from. Several options of programs and tours can be found right there if you decide to close a last minute ride. For those arriving by boat or catamaran, the port is super close to the Riva. There is no need for transfers or taxi rides from the port of Split to the Riva. Or even for the historic center or Diocletian’s Palace. The bus station is also close by, super accessible. It is also in the Riva where are the most touristic and more expensive restaurants and cafes. After all, they are the first line, overlooking the sea. But I would say they are not the best choices if you are looking for good, authentic food and good value for money. The game happens with several players organized in a circle. And it must be played in shallow waters of sea or river. The goal is to keep the ball in the air without letting it fall. The game is played with a small ball, like a tennis ball. It’s more or less like volleyball without a net because players hit the ball with the palm of their hand. There are no opposite sides, points, winners or losers. But the game guarantees many extravagant acrobatic movements and jumps to keep the ball rolling. Who goes to Bačvice guarantees besides the tan, good laughs watching to the amateurs of picigin. A small bay, blessed by the clear blue water of the Adriatic region. No sand, but white pebbles. The stunning look of this beach is thanks to a huge cliff on the right side. Between trees and stones, on the massive rock, you can notice entrances as if they were doors. But it is impossible to understand how to get there. The rock that ends abruptly and gives way to the Adriatic Sea turns this beach into a unique and unforgettable place. The beach has a super infrastructure of Joe’s Beach Bar. A beachfront bar and restaurant, full of drinks and snacks. In the afternoon the bar goes into Happy Hour and the drinks are all discounted. They also offer infrastructure for beach chairs and bungalows for rent. 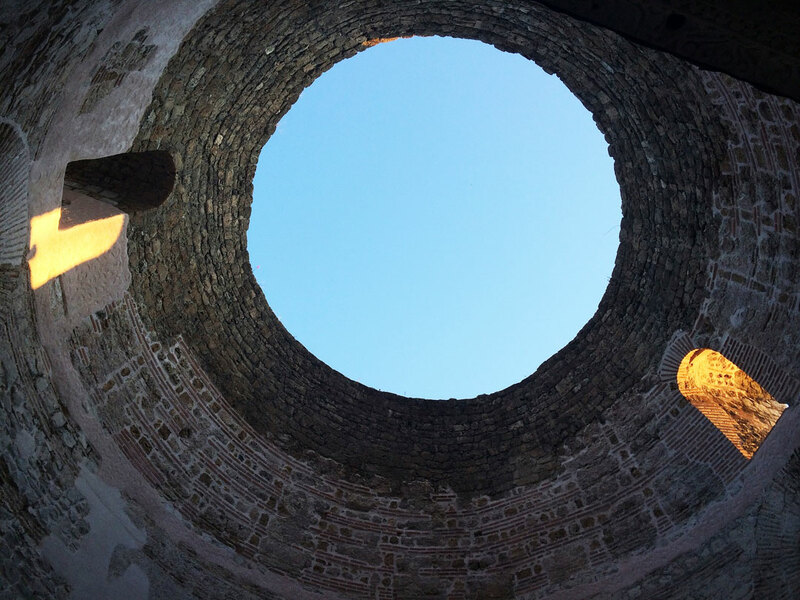 The coolest thing in Split is that it is possible to stay inside the Diocletian’s Palace. There are several hotel options, from 4* with price and service of 5*. And 3 * with a great value for money and service. Considering our experience here are some suggestions for you to see what fits your needs and your pocket. Marzito tip: for those who come by car, there is no way to park inside the palace because vehicles are not allowed. Even so, some hotels offer parking somewhere nearby. With regard to luggage, it is possible to hire “bellboys”. People, normally mans, who stay in the Riva, with trolleys to carry out luggage. They usually charge 3 or 4 euros per bag. Restaurant refined super stylish and elegant decoration. Owners are gracious, super friendly and helpful. But of course, let’s get down to business. The food is delicious. Super well made, with local products and a flawless presentation. You can see the affection of the chefs in the presentation of each dish. 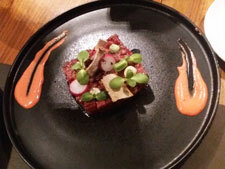 Highly recommend the biftek (filet mignon); steak tartar and tuna tartar. If you are enough people I recommend the most irreverent birthday cake I have ever seen. 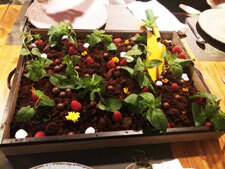 A garden simulation with chocolate cake, crunchy chocolate balls, raspberry, spearmint and other treats. The restaurant is outside the palace, but still well located and worth the money of the taxi. If you already want to spend the calories you will gain on the meal, go on foot. It’s 20 minutes walk from Riva to the restaurant. By car it takes less than 10 minutes. Local resident tip super approved by the author of the site! Very nice restaurant, inside Diocletian’s Palace. Super different decoration and design, simple and sophisticated. It makes you think about Spanish restaurants. 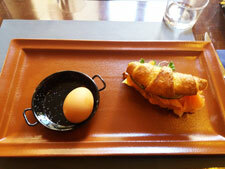 It has breakfast option, which is great – I recommend the croissant with smoked salmon! And also lunch and dinner options. The burrata is sooo delicious! 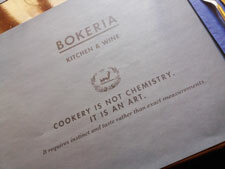 With the motto: “Cooking is not chemistry, it’s art!” It could not go wrong, right?! Split has a super location! The city is a great point for day trips in the area and also boat trips. As day trips we recommend the wineries in the region, as well as the towns of Trogir and Šibenik. 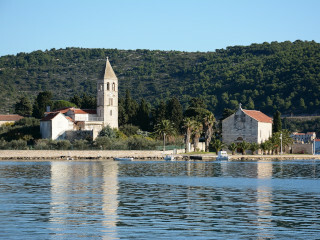 From Split, it is also possible to reach the islands of Hvar, Brač, Šolta, Vis, and Korčula. 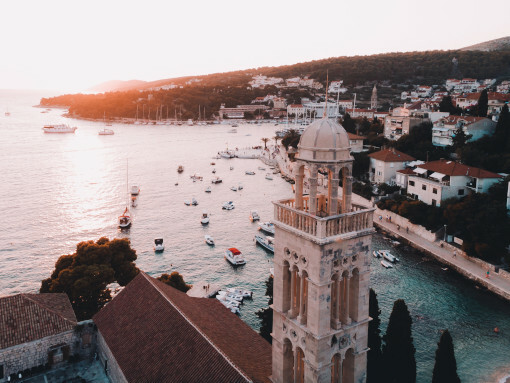 The nearest islands to make a round-trip are Hvar, Brač, and Šolta. During the summer, in the months of June, July and August there are several catamaran options for the nearest islands. In the transition months, in May and September, the options decrease. You can reach the islands by private boat or catamaran tours. The main catamaran companies are Jadrolinja and Krilo. Which also offer catamaran tickets for online purchase. Marzito tips: Catamaran tickets have defined dates and time and are non-transferable. So is very important to be on the port on time. We recommend being at the port with at least 15 minutes in advance to miss the trip. If you are driving you can get to the islands by, also operated by these companies. But by car, it’s worth making notes because it’s a bit more complicated. Ferry tickets have only date, but no time schedule in the ticket. You need to check the timetable options of the company you are traveling with. And we suggest that you be in the port at least 1 hour in advance (if it is summer we recommend at least 2 hours in advance). But don’t worry! You do not have to stand in line waiting all this time. You arrive at the port and inform yourself about the queue you should enter, considering the ferry and departure time you wish. Then you park and you can leave the car there and go stroll around or go to Riva and buy something to eat/drink during the trip. The idea here is just to “keep a place in the queue” of the ferry. Because as soon as the ferry is full, it departures. And, if you are not in the queue in advance you will stay for the next one. Do not forget to get back in the car about 20 minutes before your departure and stick around to get your car on the ferry as soon as it opens. Remembering that this also applies to the return. 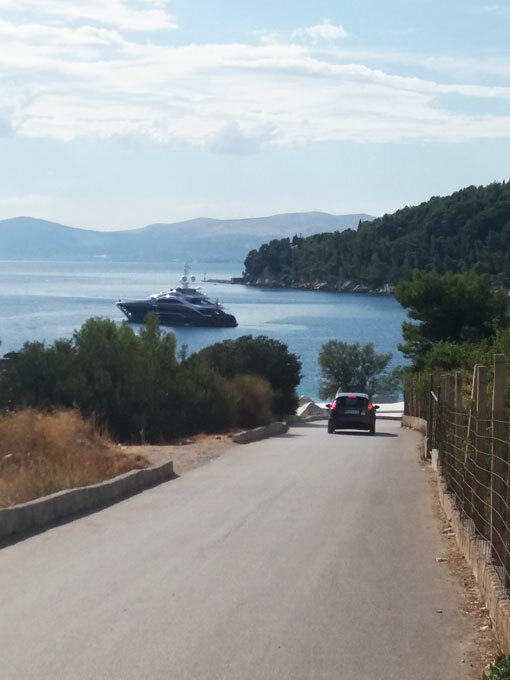 That is if you are in Hvar or Brač and want to pick up a specific ferry time. You need to consider the driving time you have until the port, plus that time in advance to arrive and save a place in the queue of the ferry. This is one of the most important tips for people traveling by car to the islands. And focus on that because in the high season the queues are huge and the ferry gets full fast. Split airport (Zračna Luka Split) is also known as Resnik Airport (Zračna Luka Resnik). And is the most used international airport for travelers arriving and departing from Split, Croatia. The airport is located 24 km (15 miles) from the city of Split and can be reached by public buses, taxis or private cars/vans. Several options for car rental, are available at the airport itself. Ultra Europe is an outdoor festival of electronic music. 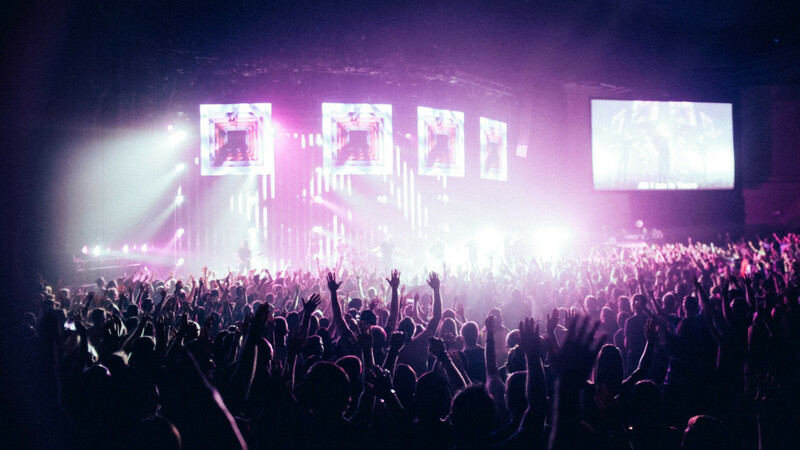 The festival is part of the Ultra Music Festival, which has already spread to twenty countries. The Ultra Europa festival began in 2013 as a two-day festival between July 12 and 13 in the city of Split, Croatia. In addition to the main event also happened the Ultra Beach. An additional party on the island of Hvar, on July 14 of the same year. After the Croatian success, the festival became part of the Ultra Destination. Now the event lasts seven days throughout the country. The event includes an opening party, three-day festival, yacht races, Ultra Beach event and a closing party. The 6th edition of Ultra Europe happens from July 6 to 8, 2018. And the whole event, Destination Ultra, happen from July 5-11. For now, are confirmed: Armin van Buuren, Axwell Λ Ingrosso, Carl Cox, The Chainsmokers, David Guetta, DJ Snake, Eric Prydz, Galantis, Hardwell, Marco Carola, Marshmello and Steve Angello. More information on the official Ultra Europa website. 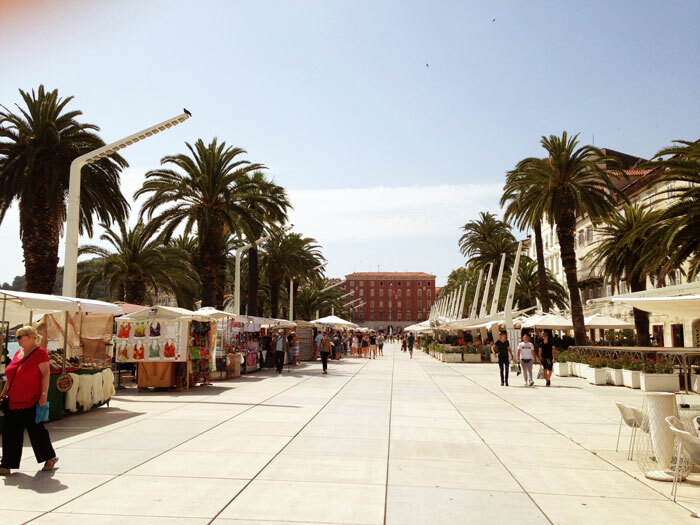 Marzito Tip: During the festival days the city of Split, gets insanely crowded. So even if you are not interested in being part of this huge electronic gathering, remember to book your accommodation in advance. If you are planning to come to Split during this period but is not interested in the festival well, then it is worth it considering to change your trip date, if possible. That is because the accommodation prices get really exorbitant at this time of the year.